KUWAIT, Nov. 4, 2012 /PRNewswire/ -- Boeing (NYSE: BA) and Kuwait airplane leasing company ALAFCO finalized an order for 20 Boeing 737 MAX 8s valued at $2.0 billion at current list price. The order was first announced as a commitment at the Farnborough Airshow in July. "This is the first order for the 737 MAX from the Middle East, which is one of the aviation industry's highest growth regions," said Ray Conner, president and CEO of Boeing Commercial Airplanes. "We are proud of the confidence that ALAFCO has placed in the 737 MAX, and hope to continue this partnership well into the future." The 737 MAX is the new-engine variant of the world's best-selling airplane and builds on the strengths of today's Next-Generation 737. The airplane will be powered by new CFM International LEAP-1B engines. Along with the engines, aerodynamic improvements to the tail and the new Advanced Technology winglet, the 737 MAX will reduce fuel burn and CO2 emissions by 13 percent over today's most fuel-efficient single-aisle airplane, the Next-Generation 737. The 737 MAX will have the lowest operating costs in the single-aisle segment with an 8 percent advantage per seat over tomorrow's competition. 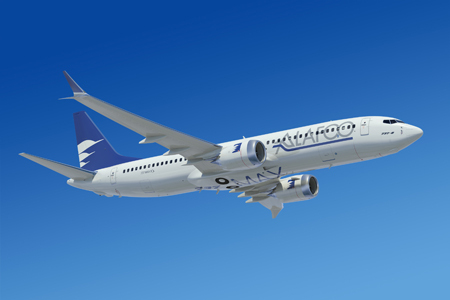 "Today, with rising fuel costs, the 737 MAX will provide operational cost savings to airlines in addition to being more environmentally friendly due to its latest quiet engine technology," stated ALAFCO's chairman and CEO Ahmad Alzabin during the Farnborough Airshow. "These are the advantages that airlines are looking for in the current competitive and demanding environment." The order brings the total number of 737 MAX orders to date to 878.